It’s been a while since I bought myself a really pretty pair of shoes, and for the last few months I’ve been really good in reigning in my usual spending habits, what with working seven days a week and having no money, but I’m afraid my good spell won’t last for much longer. That’s because I’ve fallen in love. With a pair of ASOS boots! I know, I know. I don’t have the money for them, and they can’t make me happy and they will eventually get destroyed and leave me, but just look at them! I can give them a good home; put them with some very pretty outfits and make them feel loved. Or at least until the next new crush comes along. But in all honesty, is it just me or do they remind you of a pair of Alexander McQueen boots from the spring/summer 2011 collection? 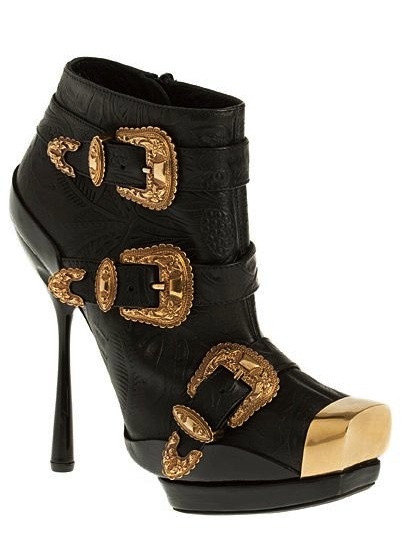 They both have those pirate-style buckles and while I couldn’t find the Alexander McQueen pair in white, they do come in roughly the same colour. Since I can’t have the original, I’ll just have to settle for these ASOS pair instead.